Arab civil wars seem to follow a pre-designed pattern. Once the conflict in a particular Arab country bursts open, the country splits into two areas (sometimes more), with separate capitals and separate ethnicities. Libya is no exception to this rule. Since the overthrow of Libya’s ruler Muammar Qaddafi in October 2011, Libya has fallen into chaos in which armed militias govern their own patch of territory. A multitude of armed groups has emerged since the overthrow of Qaddafi, some of them merging with one another, others fighting for supremacy in defined geographical areas. Three main groups are fighting for control of Libya – militias, government forces, and the Islamic State. Libya is not only a gateway to Europe, but also to three North African states (Algeria, Morocco and Tunisia) and a clear threat to Egypt. The huge arsenal left by Qaddafi has been looted, and arms have found their way through smuggling networks to Syria, Iraq, Hamas in Gaza and also to Nigeria and most of the Sahel countries. A force of African states has already engaged with terror militias. A force from moderate Arab Sunni states is under discussion. The Islamic State’s infiltration into Tunisia and Algeria could definitely pose a threat to European and U.S. interests. In such a situation the West would be forced to consider a more immediate and aggressive attitude towards the terrorists’ haven in Libya. Arab civil wars seem to follow a pre-designed pattern. Once the conflict in a particular country bursts open, the country splits into two or more areas with separate capitals and separate ethnicities. In the Arab case, the splits ultimately divide along separate religious identities: In Syria, there are two capitals — Damascus controlled by the loyalist Alawite/Shiite regime of Bashar Assad and Rakka ruled by the Sunni Islamic State. In the case of Iraq the two capitals are Shiite-dominated Baghdad and Islamic Jihad/Sunni’s Rakka-Mosul; and in the case of Yemen, Sana’a and Aden, respectively, are in the hands of the Shiite Houthis and their rival Sunni loyalists. Libya is no exception to this rule. Since the overthrow of Libya’s ruler Muammar Qaddafi in October 2011, the country has fallen into chaos in which armed militias govern their own patch of territory while successive governments have been unable to stabilize the situation and actively take control of the country. According to a BBC report1, there are more than 1,700 armed and ideologically divided groups across Libya creating indescribable havoc, which is not only fragmenting the country but bringing Libya to the status of a lawless failed state. Some of the groups are Jihadist, others secular, liberal, or split according to geographical location, ethnic identity, or along tribal lines. 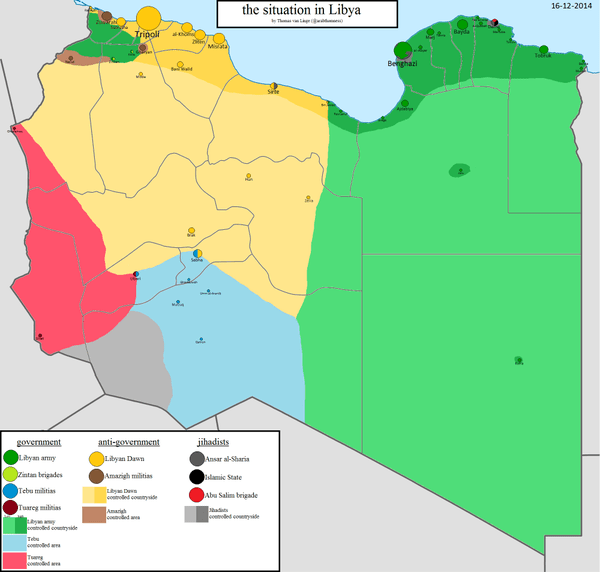 Libya has two rival governments today, one in the former capital, Tripoli in the west, backed by the “Fajr Libya” (Dawn of Libya ) militias mainly composed of anti-Qaddafi elements, and the other in Benghazi in the east supported by the Libyan National Army (LNA ) and the cohorts of an ex-CIA pampered agent, Field Marshall Khalifa Haftar. Haftar resides in the city of Tobruk, almost 1,000 kilometers to the east of Tripoli, adjacent to the Egyptian border, and is recognized by the international community. No one today can point at a body, entity, or armed group that has full control of the Libyan territory. The task of mapping the different militias in Libya is arduous since the changes, mergers and splits occur almost on a daily basis. However, there are a few constants and key militias that have survived the test of time. The Libyan National Army, led by General Khalifa Haftar, came to prominence in February 2014, when he declared the “suspension” of the government, a move that was promptly rejected by the authorities. Three months later, his militias launched a successful offensive against Islamists in Benghazi. On March 9, 2015 9 anti-Islamist Haftar was sworn in as the new army commander in the Libyan parliament. Khalifa Haftar was a colonel under Qaddafi. He led Libyan forces during a disastrous war with Chad in the south. After his defeat by Chadian forces in 1987, he was taken captive for almost five years, refusing to return to Libya out of fear Qaddafi would “punish” him for his defeat. Later, the CIA succeeded in whisking him out of Chad together with 300 of his men to Virginia where he underwent special training by the CIA. After living in exile in the U.S. for 20 years, he returned to Libya and led ground forces to help oust Qaddafi in 2011. Al-Zenten Revolutionaries’ Military Council: Formed as an umbrella for 23 militias in Zenten and the Nafusa Mountains in western Libya, the military council has five brigades, and a satellite channel called Libya al-Watan. Estimated at 4,000 strong, it is best known for detaining Muammar Qaddafi’s son, Saif al-Islam Qaddafi, after his capture in November 2011. The Zentenis have clashed on more than one occasion with Jihadists in Tripoli. Al-Q’aq’a Brigade: Formed by rebels in Zenten in 2011 following battles with Qaddafi’s forces before he was toppled. The al-Q’aq’a brigade is commanded by Uthman Mulayqithah who defected from Qaddafi’s regime at the start of the uprising. Officially under the Defense Ministry, the militia is tasked with protecting senior officials and government ministers. Al-Sawaiq Brigade: Originally from Zenten, al-Sawaiq took part in the assault on Tripoli in September 2011. Since then, it has provided personal protection for senior figures at the National Transitional Council, changing its name to al-Sawaiq Brigade for Protection. The Sawaq Brigade, led by ‘ Imad Mustafa al-Tarabulsi, is considered one of the strongest factions in Libya. Misrata Brigades: In the immediate aftermath of Qaddafi’s overthrow, more than 200 militias, or “revolutionary brigades,” registered with the Misrata Union of Revolutionaries, comprising about 40,000 members. Misrata is Zenten’s main competitor for power and influence in Libya. The Misrata Brigades align with Muslim Brotherhood and its political party, the Justice and Cooperation Party. 17 February Martyrs Brigade: Headed by the Jihadist Abd el-Hakim Belhadj, the 17 February Martyrs Brigade was created in a joint effort between France and Qatar. The February 17 Battalion is the biggest brigade affiliated with the Muslim Brotherhood. It is centered in Benghazi and receives financial support from official parties, mainly from the Ministry of Defense. It is thought to consist of about 12 battalions equipped with light and heavy weapons. The group has carried out various security and law and order tasks in eastern Libya and Kufra in the south. Ansar al-Shari’ah Brigade: Headed by Mohammad el-Zahawi, Ansar al-Shari’ah is a Salafi militia that came to prominence in June 2012 when it paraded armed vehicles in central Benghazi to demand the imposition of Islamic law, or Shari’ah. It was accused by the U.S. of being part of the attack that led to the burning of the U.S. consulate in Benghazi in September 2012 and the murder of U.S. personnel. Although Ansar al-Shari’ah has helped provide security in public places, it has also been accused of human rights abuses, and was involved in the destruction of Sufi shrines. Ansar al-Shari’ah, the biggest armed jihadist group in Libya (3,000-5,000 militants) includes Libyans and foreign fighters from Tunisia, Algeria and other African countries. It is blacklisted by the United States as a terrorist group. The Tripoli Brigade: Close to Abd el-Hakim Belhadj , head of the Al-Watan party, the Brigade was supported by France and Qatar during the revolution. The brigade includes between 500-1,000 militants, some of them foreigners, including from Ireland, and is mainly active in Tripoli and western Libya. The Souk el Jouma and Sadun al-Suwayli Brigades led the final attack on Syrte, in which Qaddafi was killed. The Warfallah Brigade, based mainly on the Warfallah tribe accounting for more than a million members, is centered in Benghazi. Although it had announced that it was joining the Libyan army, it has kept its own arms and camps. The Megarha Brigade, affiliated with the Megarha tribe, is a pro-Qaddafi faction. It is centered near Tripoli, and its aim is to protect the tribe from armed militias. 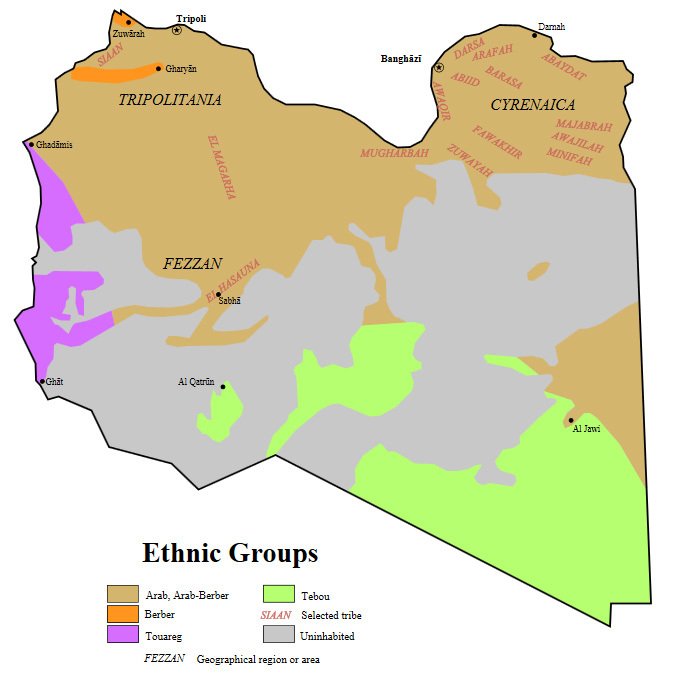 The Toubou Brigade, composed mainly of militants from the southern ethnicity of the Toubou, is active in the southeast of Libya, from the border with Sudan to the border post of Toumou facing Niger. The Touaregs control the southwestern part of Libya, from Toumou to the Algerian border. Arab tribes (Ould Soleiman) are in control of the main desert city, Sebha. Libyan army: The “new” Libyan army was established by a decree issued by the Transitional National Council in 2011 and included all deserters from the army of the previous regime. According to different sources, the Libyan army consists of about 35,000 soldiers and equipped with the “leftovers” of the Qaddafi arsenal. The army is slowly beginning to emerge as a viable, if not yet effective, force. The army has been training new recruits and, after Misrata’s militias withdrew from Tripoli in November 2013, has been deployed to provide regular security on the streets for the first time. However, it lacks experienced soldiers. Many of those who served in the army under Qaddafi and survived the war have chosen not to return to work. Libya Revolutionaries Operations Room: (LROR), headed by Adel el-Tarhouni, is considered a strong supporter of the Muslim Brotherhood, which has used it in its political disputes with its rivals. The 200-350-man force was stripped of its power by parliament after its members kidnapped then Prime Minister Ali Zeidan in October 2013. National Security Directorate, (NSD) headed by Mahmoud Sherif, is Libya’s conventional police force, tasked with investigating crime and traffic offences and protecting public property. The NSD amounts to 7,000-9,500 men. Al-Sa’iqa Forces is said to be Libya’s elite army unit, made up of paratroopers and commandos. It initially came to prominence after it was deployed in Benghazi to control the chaos in the city. The force is popular in Benghazi because of its stance against the Islamist Ansar al-Sharia group and because it is seen as a symbol of the reborn Libyan armed forces. More recently, Al-Sa’iqa joined Field-Marshall Khalifa Haftar, who in May 2014 launched “Operation Dignity,” targeting Islamist militias. Anti-Crime Unit: Headed by Abd el-Hakim Blazi, this unit under the Interior Ministry functions as a de-facto police investigations unit and carries out arrests, mainly for drug offences. Another unit under the ministry, the Special Deterrence Force (SDF), also combats drug trafficking. Petroleum Facilities Guard: The 20,000-man Petroleum Facilities Guard (PFG) was set up in 2012 specifically to protect Libya’s oil installations. The oil plants survived the war largely intact, but most of the installations were destroyed recently in combat between the militias and the Islamic State militants. Libya Shield 1 Force: Led by Wisam Ben Hamid, the Libyan Shield 1 Force has four brigades across the country. It was set up in 2012 as a temporary vehicle for integrating former rebel fighters into a cohesive national force, but it has clashed with other government-sponsored forces, such as the special forces unit of the Libyan army. The Libyan Shield Militia is affiliated with Misrata and close to the Brotherhood and recently allied with Ansar al-Shari’ah. Although it says its forces are linked to the Defense Ministry, its leaders do not belong to the official military institution. The force has been accused of torturing Coptic Christians in a secret prison in Benghazi. The IS militants made their first move on October 30, when they succeeded in taking over the city of Derna, 285 kilometers east of Benghazi, almost half-way between Benghazi and the Egyptian border. Later, the IS militants stormed and conquered the cities of Nofilia and Syrte (the birthplace and tribal hinterland of the Qaddafi tribe). On January 27, 2015, the Islamic State militants launched a high-profile attack in Tripoli, bombing the Corinthia Hotel, but the Islamic State really succeeded in capturing the world’s attention only after releasing a video showing the beheading of 21 Egyptian Copts. Five days later, an Islamic state militant killed at least 20 people in a suicide bombing in the eastern town of Al-Qubbah. The New York Times6 reported that there are IS affiliates in each of three Libya’s provinces, and in December, U.S. Africa Command head David Rodriguez said that IS had set up training camps in eastern Libya. According to some sources, the number of IS jihadists in Libya’s southern Fezzan area could be in the thousands. However, the Islamic State is finding it difficult to establish itself in the area, since most of the militias are battling it in an effort to prevent the spillover of the IS to other major cities in Libya. At the moment, the Libyan effort against the IS is concentrated in the Sidra area in an attempt to drive the IS out of the oil-rich area. The situation in Libya is disturbing. Libya is not only a gateway to Europe, but also to the three North African states (Algeria, Morocco and Tunisia) and a clear threat to Egypt. Moreover, fighting in Mali has proved that the huge arsenal left by Qaddafi was used by the Touaregs to conquer Mali in 2013. Weapons originating from Qaddafi’s looted arsenal have found their way through smuggling networks to Syria, Iraq, Hamas in Gaza and also to Nigeria and most of the Sahel countries. The French for their part have decided to prevent jihadist organizations from returning to north Mali. The French are aware of the lawlessness of southwest Libya, and that chaos enables any jihadist organization to arm itself, hide and train in the area. This is why the French Republic has deployed an intense intelligence, electronic and communications network backed by French Special Forces, U.S. attack and spy drones (deployed in Niamey, Niger’s capital),10 and other means meant to stop any advance by terrorist groups in the area. Paris has been leading an awareness campaign by stressing the dangers of Libya’s “Jihadistan” to the Sahel and central and West African countries, including Nigeria, and the need to stop its expansion. The French have been preaching in almost every European capital, especially in those capitals adjacent to the Mediterranean sea (first and foremost, Italy, a 1.5 hour flight from Libya ) who see themselves as potential targets for waves of Jihadists coming from North Africa, crossing the sea and establishing themselves in Europe. First to respond was the U.S. administration which launched a Delta Force commando operation which succeeded in capturing in Tripoli in October 2013, Abu Anas el-Libi, a high ranking Al-Qaeda operative.11 Egypt followed the American intervention when President Sisi ordered his air force and commando units to attack Jihadists targets in Cyrenaica as retaliation for the beheading of 21 Christian Copts in February 2015. The United Arab Emirates’ air force also carried out strikes in Libya. Since the horrifying beheadings in Libya in February 2015, the Egyptians, together with the Saudis, have been advocating the creation of a pan-Arab military intervention force whose mission would be to combat Jihadist terrorism in Arab lands. Until now, there have been only talks about this force, and most probably it would take some time before it becomes a reality. In the meantime, the Africans have already dispatched multi-state forces to fight Boko Haram in Nigeria and the Jihadists in Mali. The spearhead of this pan-African force is the Chadians, seconded by contingents from Burkina Faso, Niger and Cameroon, while the Western Powers are providing mainly intelligence and drone support, with the exception of France, which is present with ground troops in the conflicts in Mali and Central Africa. The more the situation in Libya becomes chaotic the more there is talk of outside military intervention in order to put an end to the anarchy. At this point, there seems to be a lack of fervor in Europe and the U.S. to intervene in Libya with “boots on the ground.” A pan-Arab force would be welcomed by the West. However, it does not look as if it will be operational in the very near future. As a result, the containment of the IS in Libya is going to be the individual task of each of the parties concerned. Special attention needs to be focused on Algeria and Tunisia that have been designated by the IS as their next targets. IS infiltration into those two North African countries could definitely pose a threat to European and U.S. national interests. In such a situation, the West would be forced to consider a more immediate and aggressive attitude towards the terrorists’ haven in Libya. 4 Jamil Abou Assi, op.cit. sup.cit. 5 Why is Libya lawless?, op.cit.sup.cit.